“As I hoped, the 2009 Muns Pinot Noir remained definitive of Santa Cruz Mountains terroir, loaded with style, black cherries, and elegant tannins. The 2012, a rich garnet hue, was still enjoying big tannins—this wine will age on and on. I was very impressed with Muns 2013 Pinot Noir (like all these wines made from the estate’s Dijon clones)…. “Muns’ 2009 Pinot Noir is set to show up on Home’s expanding wine list, and Vino Cruz (practically across the street) is currently running a vertical of Muns Pinot Noirs. The essence of our region.” Christina Waters in Good Times Santa Cruz, Dec. 6, 2017. See more here. “Muns Vineyard 2011 Syrah: A Complex Syrah Grown 2600 Feet Above Monterey Bay”, by Josie Cowden, Good Times Santa Cruz, Oct. 17, 2017. Rich, well-balanced and complex, with intense aromas and flavors of dark fruits, licorice, earth and herbs. See more here . Muns Vineyard came through that heat wave “just fine,” says Lindsay. “We had been irrigating, even with all the 80 inches of rain we got last winter, because we had a lot of new vines. Then, when we knew temps were going to heat up, we irrigated as much as we could. The irrigation helps the vines and the fruit ride through the heat.” See the story here. “Does 2017 start of harvest signal return to normal for winemakers?“, by Mary Orlin, The Mercury News, Aug. 8, 2017. Ed is quoted about the 2017 growing season and upcoming harvest: “Vintner Ed Muns of Muns Vineyard is looking to an early September harvest start. His pinot noir and syrah vineyard sits at 2,600 feet in elevation above Monterey Bay, one of the highest in the Santa Cruz Mountains.“We had 85 inches of rain last winter compared to our long-term average of 30 to 35 inches,” Muns says. Thanks to consistent weather during the growing season, his vines have been “charging forward,” developing sugars and flavors more evenly.” See the story here. California Wine Fan names Muns Vineyard’s 2010 Estate Pinot Noir the ‘Best of Show’ at Stanford Art & Wine (see the article here). Wine of the Week: Unwind with a Muns syrah, By Stacey Vreeken, Santa Cruz Sentinel, July 1, 2015. “…2010 estate-grown syrah that given time to unwind, opens up to your senses. Dark fruit, oak and earth reflect the grace and strength of this syrah, grown on one of the tallest peaks of the Santa Cruz Mountains overlooking Monterey Bay.” See the full review here. Wine Press: Elevation shows in Muns Vineyard mountain-grown pinot, By Stacey Vreeken, Santa Cruz Sentinel, June 9, 2015. What do winegrape growing and ham radio have in common? This is a great story (if we do say so ourselves) about Ed and Mary and Muns Vineyard. “When Ed Muns landed atop Loma Prieta, it wasn’t to grow grapes — that came later — he wanted the elevation to set up his ham radio antenna. At 2,600 feet, it was “awesome,” says the avid operator who has set world records with his prowess at ham radio contesting. …” See the story here. The view south toward Monterey from Muns Vineyard, in the Summit area of the Santa Cruz Mountains, is expansive and inspiring. Los Gatos Weekly cover article by Marrianne Hamilton on 30 January 2015 about Ed’s ham radio contesting. Says Josie Cowden about our 2013 Rosé of Pinot Noir in Good Times Santa Cruz: “This vivacious cherry-pink Rosé is a simply beautiful summer wine. Full of bright aromas of strawberries, watermelon and a smidgen of apricot, the Muns Vineyard Rosé of Pinot Noir, 2013 has an enticing fragrant nose to appreciate before you get to the first lovely taste of bright fruit flavors. Crisp and dry, it’s a refreshing delight on a summer’s day—and it’s perfect to pair with picnic fare and appetizers.” Read the review online in Good Times, July 30, 2014. Our 2013 Rosé of Pinot Noir is the featured wine in the Summer edition of Edible Silicon Valley. Says Mary Orlin in her story, “This beautiful strawberry colored wine is fermented completely dry. It’s a crisp, bright juicy wine. Beautiful aromas of fresh strawberries, watermelon and a hint of apricot with zesty acidty.” Read the review online in Edible Silicon Valley. An ‘outstanding Pinot Noir discovery’, says Christina Waters in the Santa Cruz Weekly. “It exudes spice – star anise, white pepper, bay leaves – with a seductive velvety core of tangerine, cherries, and birch bark… Each sip implies intimacy as well as infinite distance. We were practically breathless with admiration. This is a Pinot capable of partnering with everything from sturgeon to grilled cheese to rack of lamb. … wine can walk on water.” Read the entire review here in the Santa Cruz Weekly, Feb. 25, 2014. And in her blog (here) on Feb. 21, Christina Waters raves: “From Muns Vineyard comes a spectacular example of Santa Cruz Mountains terroir. Muns’ 2009 Estate Pinot Noir is everything you could want in a brilliantly balanced wine. From the nose of white pepper, roses, and licorice, straight into an expanding heart of tangerine, bay leaves and a long, slow finish of black cherries, this is a gorgeous pinot noir. Its luscious 100% pinot noir grape composition has been coaxed into elegant nuance by aging in Hungarian oak, and at a highly desireable 14.1% alcohol it is light enough to partner almost anything, yet won’t get in the way of simply kicking back and enjoying. This could be one of the top five pinot noirs I’ve ever tasted, and one that justifies our pride in what the SCMtn appellation can produce.” Thank you, Christina! Muns Vineyard is included in a story by Donna Jones in the Santa Cruz Sentinel, Feb. 14, 2014, “Santa Cruz Mountains winegrowers expect smaller 2014 harvest after 2013 bumper crop.” This is about the lack of water over the previous year, and the unseasonably warm Spring weather starting out 2014. See the full article here. (This was also printed in the San Jose Mercury News). Santa Cruz Mountains winemakers can thank Mother Nature for this year’s bountiful grape crop. By Shannon Burkey, San Jose Mercury News and Los Gatos Weekly Times, November 6, 2013. “This harvest has just been really fabulous,” Mary Lindsay said. “Everybody is really jazzed and is feeling that this has been an extraordinary year in so many ways.” Read all about it in this PDF. Coastal Wine Harvest is Early and Booming Santa Cruz Mountains growers enjoy spectacular 2013 season, by Jane Firstenfeld, Oct. 9, 2013. Following what they are calling a “phenomenal growing season,” most wine grape growers in the Santa Cruz Mountains AVA just south of San Francisco are “totally jazzed about this year’s vintage,” according to Mary Lindsay, co-owner of 300-case Muns Vineyard in Los Gatos, Calif., and president of the Viticulture Association of the Santa Cruz Mountains (VASCM). Read the article in this PDF. Mary and Ed are interviewed by the Santa Cruz Sentinel in an article about the impending 2013 harvest, published on the front page of the paper Saturday, August 17, 2013: “Early, bountiful harvests anticipated in Santa Cruz Mountains vineyards”, by Donna Jones. “Vineyards are only weeks away from what’s looking like a bountiful harvest. Last year was good. This year is even better.” See a PDF of the article here. “Pleasing aromas of black cherries, red plums and roasted nuts. Delicious mid-weight flavors of dark stone fruits with a subtle riff of spice. The tannins and acidity are nicely balanced and this wine drinks seamlessly. Exceptional.” – Rusty Gaffney, ‘The Prince of Pinot’, about the 2009 Muns Vineyard Pinot Noir in PinotFile. See the full review from Pinot Paradise here. “Consumers looking for a prettier style of pinot should enjoy the 2009 Muns Estate Pinot Noir ($40), with its crushed strawberry, spice and hint of vanilla.”, Laurie Daniels, San Jose Mercury News, April 10, 2013, in this article about Pinot Paradise. Muns 2009 Pinot Noir, Estate, Santa Cruz Mountains. Medium-light color, this showed up front black cherry and plum aromas along with earth, fresh herbs, and notes of baking spice. Medium-light bodied, the tannins were noticeable but refined, nice. 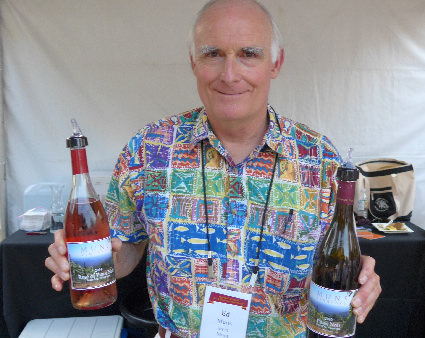 Ed is interviewed by Western Farm Press about the 2012 vintage. Wine grape growers in the Santa Cruz mountains are very optimistic about this year’s crop. Veteran Pinot Noir grower Ed Muns says, “Everyone around here is reporting great fruit and a prolific set. … This could be one the best harvests in this region in 15 to 20 years.” Greg Northcutt, July 25, 2012. Sentinel, Sept. 19, 2012. “Everybody’s looking forward to making some great wine from this vintage,” Mary said. A video interview with Ed & Mary in the vineyard on Patch.com: Muns Vineyard is a Pinot lover’s paradise! Muns Vineyard’s 2008 Syrah is the featured ‘Sip of the Week‘ in the Santa Cruz Sentinel, 2/23/11. Muns Vineyard’s 2007 Pinot Noir is the featured ‘Sip of the Week‘ in the Santa Cruz Sentinel, 10/6/10. “Because Pinot Noir and fall go together. Think Thanksgiving! Try it! We think you will really like this delicious Rosé. Muns Vineyard Pinots are featured in a story in the Santa Cruz Sentinel, with recipes from local vintners – including Mary’s now famous recipe for pan-roasted Brussels sprouts, that pairs deliciously with our 2004 and 2005 Pinot Noirs. Ham Radio Creates a Vineyard! – Ed is quoted in the 17 October 2009 article in the Los Gatos Weekly-Times, “Amateur Radio Operators on Front Lines During Loma Prieta Quake”. Although Ed wasn’t one of the active hams helping with that local disaster, the article notes that the property that eventually became the current Muns Vineyard was selected for ham radio purposes by Ed. The first day of land clearing for the home occurred on 17 October, 1989, the day of the destructive Loma Prieta Earthquake, whose epicenter was just five miles south of the property. Read about Muns Vineyard in the Santa Cruz Sentinel (September 12, 2009), in an article about the 2009 harvest. It includes a number of photos of harvest at Muns Vineyard. “A consistent Muns Vineyard style is beginning to evolve with this wine which shows similarities in structure and character to the 2006 vintage. This wine exhibits admirable complexity with nicely spiced red and black fruits, herbs, forest floor and mocha. There are still tannins to shed, but these are ripe and fine and will integrate nicely with a little more bottle age. The acidity is spot on. This should prove to be a very stellar wine.